The Timeless Series Porcelain is made in Italy. It is available in 4 colors: Amani Grey, Bardiglio Grey, Black Deep and Eramosa. It’s available in Polished Porcelain in 12″ x 24″ and 1″x1″ mosaic. 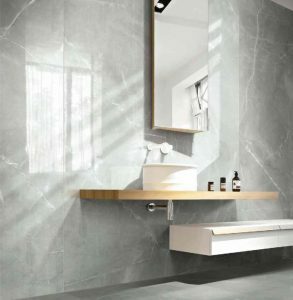 Other sizes include Polished Porcelain in 31.5″ x 94.5″ x 6mm porcelain wall panels as well as a 12″ x 24″ Matte Porcelain Tile in the color Amani Grey.